Decking in Shropshire isn’t complete without some light, and luckily here at Weston Sawmill we also provide a variety of styles of lanterns that can fit any style of decking. Although the temperatures are quite chilly right now, there’s nothing you stopping you planning and visualising those nights out on the garden decking once the warm weather comes around again. Our lanterns will also save you money on your electric bills, as you can use candles or battery powered fairy tea lights (both of which don’t require a fixed electrical source) to spread light across your garden. This will also give your decking a unique look and certainly get your neighbours talking. 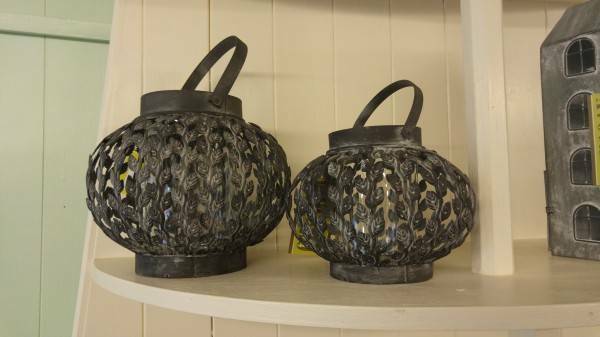 Weston Sawmill’s range of lanterns offers the best of both worlds! Whether you are looking to complement a contemporary or vintage look we have a style of the lantern that will fit right in. Our range of storm lanterns can be used on an outdoor table on your decking in Shropshire. Lining them along the length of the table adds a subtle light for cosy nights outside during the summer for a modernised design. Another use for our range of lanterns in your garden. There is a growing trend which we’re right behind of hanging them from your trees close to your decking. As it is with the tables this brings warmth and creates a cosy atmosphere which blurs the lines between your indoor living areas and outdoor decking. Our range of small metal lanterns is sturdy so you can also use them to light a pathway to your shed or pond, without the fear of them falling over and breaking. With their intricate patterns, they will also display the candle lights in an innovative way! For more of a vintage look. Weston Sawmill has been providing lighting solutions for decking in Shropshire and the surrounding areas for over 20 years. If you’d like to know more about our range of lanterns, contact our friendly team today to discuss your requirements. This entry was posted in Weston Sawmill and Nursery and tagged decking in Shropshire, lanterns on January 26, 2019 by admin.